One thing to be noted this year is my hair has certainly been through some changes. My hair has kept the slight ombré effect I started from late 2012, I went from a light brown with blonde tips. I continued to lighten it and experiment with colour, pink + purple, raspberry pink letting it fade into a pastel. I then continued to bleach the hair to lighten it more. Let's not forget the failed keratin treatment that didn't help my hair one bit. I've straightened my hair more than I did during 2013 therefore months of repercussions on top of using peroxide, led me to have to find alternatives to treat my hair and to pay a lot more attention than before. It's fun to experiment with colour but if there's one thing I've learnt the curls can pay the price but with more TLC, it can be repaired as much as possible. The reason I've stayed with the ombré style is because the upkeep isn't too much of a hassle. 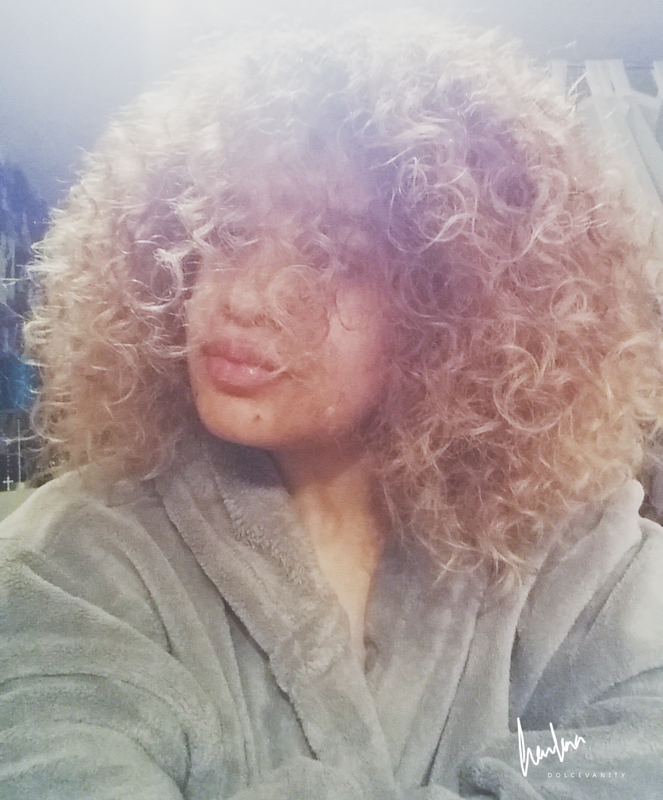 The few things that I have to keep watch of is the brassy tones and making sure the curls are defined and healthy. I say it's expensive because there needs to be an investment in products for colour treated hair and the deep conditioning needs to be upped. The hair can be more dry and possibly brittle, it really depends on your hairs condition before the process. I feel the dirtier the better, using the hairs natural oils and the additional oil can help the hair. A day before bleaching I smoother the hair in coconut oil, it acts as a slight barrier while penetrating the hair shafts with moisture, something that is lost during the hair colouring process. I'll put a shower cap on and leave it on overnight to give it the best soak. The next day I begin the process the bleaches I normally opt for are available in Boots either the Bleach DIY Dip Dye Kit or Jerome Russell BBlonde Highlighting Kit. The last time I bleached my hair I used the TIGI Copyright Colour True Light & Tigi Copyright Colour Activator 20%. Section the hair into 4 sections and starting from the back I work quickly through the hair, I wrap each section in tin foil, I check the hair every 10 minutes until I see the desired lift. The hair can often look brassy not so much using the TIGI colour but I treat my hair immediately after rinsing the hair. I always stick a box dye on the hair afterwards to tone down the hair and get the shade of blonde I can live with, brassy hair I cannot live with lol. Nice'n Easy Permanent colour #9A Natural Light Ash Blonde I will put this on 48 hours after bleaching my hair and again start treating the hair. I've read that you should hold back on shampooing the hair as the natural oils will help to deep condition your scalp and hair. You know the natural sebum! I'm in two minds, since experimenting I've had to find out what works well for me. I find that due to product build up and wearing the hair out my hair can change colour pretty fast and get brassy when dirty and environmental factors. Every fortnight I would wash my hair with a toner shampoo. Currently I'm using Clairol Shimmer Lights, I will just wash normally but no-pre poo and sit with the Shimmer Lights for as long as possible with a shower cap on and then continue to start my normal regime but I've been using the Fudge Clean Blonde Violet Toning Shampoo instead. There's no lathering, I just slap it on if I leave it on longer than 5 minutes my hair darkens to a violet shade and will fade to a grey before the blonde is back. 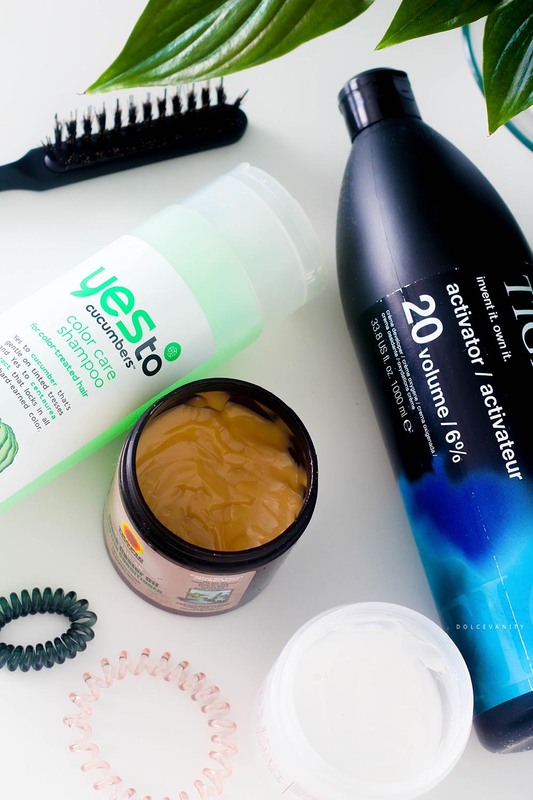 In between the need for toning of the hair, I've been using Yes To Cucumbers Color Care Shampoo to keep it protected and limit as much brassiness as possible. Deep treatments need to be upped, it depends how regularly you already do yours, I try at least to do them 2x a week and my hair benefits from that. I wash my hair every 3 or 4 days now. The hair needs a lot of protein, something lost during the bleaching process. Every 6 weeks the Aphogee Two Step Protein Treatment but for something that can be used more often I've opted for Jamaican Black Castor Oil Protein Hair Conditioner. Also another great product I always have to keep is the Philip Kingsley Elasticizer Extreme! Leave-in conditioners are something I've got use to, trying to make sure there's that added moisture into my hair before it begins to dry. Leave in's are formulated differently to our rinse out conditioners, they tend to be a lot lighter and more watery. Leave-in conditioners typically contain humectants that attract moisture into the hair strands. Water based leave in's are best for this, my favourite is GVN Direct Leave-In Conditioner. I know, we've got this fabulous new hair colour, why can't we show it off? It's a tough one for me, I can't wear my hair out too often as it dries out very quickly inside (central heating) and outside (cold air or humidity) it's this lose - lose situation. I've found top knots are a fun and chic way to protect the hair and to show off the colour. I can wear my hair out for a couple of days after my wash day but it's all about protecting the hair at night and I make sure my hair is nicely moisturised during the night before doing the pineapple method and or sleeping on a silk pillowcase. I don't know if other blondes have noticed this, when I use some hair moisturisers, my hair gets brassy quicker and sometimes doesn't look as nice as I'd like? I've been using the Big Hair Leave in Moisturising Milk & Big Hair Moisture Me Whipped Butter. There's a lot of days I just feel to go back to all dark hair as the hair can look healthier and glossier especially with curls if the hairs not naturally this colour. I suppose it's all about how you treat and care for the hair. Bleaching hair and the upkeep can be a nightmare. I think the big chop is just what my hair needed. I can't imagine it's easy for people with crazy curly hair like yours! The coconut oil definitely helps! Although I'll be honest, I haven't done it the last few times because... I forgot. Really want to try that hair butter, it sounds larvely.